Everyone is familiar with measuring things, but two American authors have taken systems of measurement to what might be a logical conclusion. Their paper is a good read for anyone with a little science background. 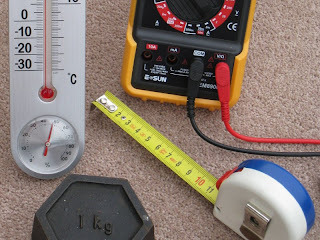 When we think of measurement most of us think of rulers, tape measures, kitchen and bathroom scales, filling up with petrol or how much paint to buy to redecorate the lounge. And it's true - all of these things involve measurement. But when we talk about a system of measurement we are referring to a coherent, complete and consistent set of defined units that will allow us to measure anything. The best known system of measurement is the SI standard that has been officially adopted by every nation apart from the USA, Liberia and Myanmar. Amongst older systems of measurement the CGS, Imperial and Avoirdupois (mass units only) are some of the best known. And historically there have been many systems going way back to ancient Babylonian times and before. But we can work in a much more fundamental way (though for practical reasons we normally choose not to). A recent paper by L Hsu and J Hsu from the Universities of Minnesota and Massachusetts shows how this can be done. They define everything in terms of time though they point out that any other fundamental unit could have done the job. In passing it becomes clear why time and space can be combined as space-time and how some fundamental constants are more fundamental than others. This system is what is known as a natural system of units. Fascinating stuff. Anyone can read the paper as it's not particularly complex, though school level physics and maths will be needed to follow the detailed reasoning.